The high cost of Auckland hotels caught me by surprise. Room rates over $150 USD per night were common for my November 2016 dates. My objective for staying at Choice Hotels seven nights to requalify for Platinum elite in 2016-2017 was set in part due to some of the lowest hotel rates available at Choice Hotels. Upon arrival to Auckland I stayed at Quality Hotel Auckland Parnell. The room rate was $50 more than staying at EconoLodge Auckland Central. TripAdvisor reviews scared me off Econolodge, but then the following weekend I stayed at EconoLodge Auckland Central. In short, Econolodge has a fantastic city center location in many respects, while Quality Hotel Parnell offered a nicer room in a nicer residential part of Auckland, away from the urban skyscrapers and street people of downtown. Quality Hotel Parnell room view to Auckland Central about 2 miles away. At Auckland Airport I stopped at tourist information and asked about transportation options for the hotel. I was staying in Auckland for Sunday night only before flying to Napier the next day. I was quoted a $70 NZD ($50 USD) round trip super shuttle type option for hotel drop-off or $32 NZD ($23 USD) for the SkyBus to Auckland Central and take another bus to Parnell. Bus service was sketchy on a Sunday evening and walking two miles looked like a quicker option. The walk from Auckland Central showed 40 minutes on my iPhone map. I was ready for a good long walk after flying from San Francisco to Sydney on a Qantas 14.5 hour flight and a few hours in Sydney Airport, followed by three more hours on a plane. I paid $32NZD/$23 USD for my SkyBus round trip ticket. Within 15 minutes I was on my way from the airport to Auckland Central Queen Street. My iPhone was fully charged, and after about 30 minutes on the bus, I was with walking down Queen Street with phone map in hand. What I learned from my 40 minute walk from Auckland Queen Street to Quality Parnell is the city is built on a series of hills. I walked downhill, then uphill, then downhill and back uphill to reach Quality Hotel. My revelation during the walk across Auckland is a great app would be a map that shows walking routes by elevation gain. Walking back to Queen Street the following day by a different route resulted in only one downhill and one uphill climb. 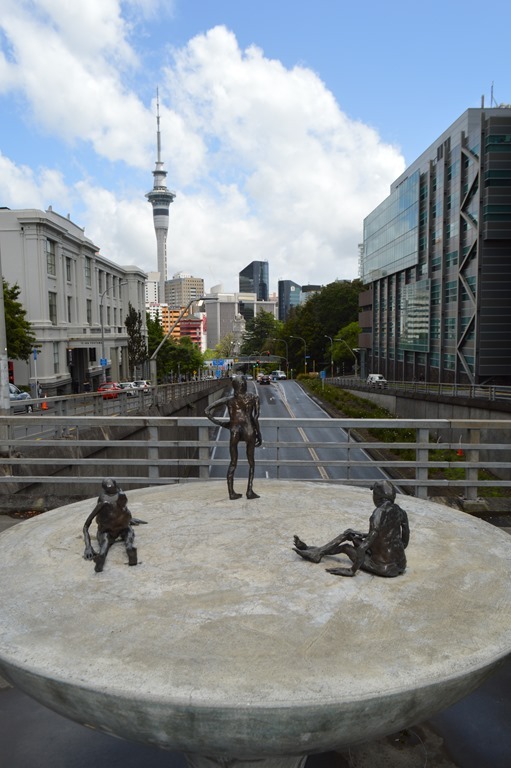 Parnell is considered an upscale residential area of Auckland and Newmarket rivals Auckland Central for dining, shopping and entertainment. The residential features of Parnell are a nice aspect about the Quality Parnell Auckland hotel location. The hotel is across the street from an elementary school. Quality Hotel Parnell is a small conference center hotel. Seemed like most guests I encountered at the hotel were attending a conference. The main building with reception is the part of the hotel I stayed. My room was on Floor 4 of the 5 floor hotel. The room was functional with a desk, King bed, minifrig, coffee maker, TV and good Wifi access. Aside from a couple hours napping on the SFO-SYD flight, I had been awake for about 36 hours. It was not long before I crashed out on the bed, skipping dinner. Monday morning I was up and working on my computer before 5am. The weather outside looked like rain and I heard some claps of thunder in the distance. By 7am I was ready for breakfast and strolled over to the Quality Hotel restaurant Gladstone’s in the other building in the Victorian house. My breakfast surprise was learning there was no free breakfast. Turns out that as far as I could tell, complimentary breakfast is not a feature of Choice Hotels in New Zealand. I stayed at three different hotels and they all charged for breakfast. Since it was not raining, I headed out to walk the Parnell neighborhood seeking a market or breakfast café. I was surprised at how few options I found in the neighborhood. Food prices kind of blew my mind. Domain Ayr was the first place I found with full breakfast meals priced $18.50 to $22NZD ($12.70 – $15.90 USD) with free range eggs. Simple eggs and bread was only $11.90NZD ($8.40USD). Of course there is no additional tax or tip required, so not too bad, but more than I was expecting to pay for a breakfast meal. The Bee Hive, a second cafe I found, had hamburgers on the menu. I felt like eating a fresh-cooked burger to start my Auckland morning. Hamburger and chips (french fries) were $11 NZD. The Bee Hive, Newmarket Auckland. Apparently I had crossed from Parnell to Newmarket on Broadway according to the address given in the link above for The Beehive. In short, breakfast at Gladstone’s Restaurant at Quality Hotel Parnell was comparably priced to neighborhood restaurants open for breakfast. TripAdvisor.com reviews Quality Hotel Parnell #18 of 68 Auckland hotels. My room rate was $153.90 NZD ($111 USD). Choice Privileges reward rate during my stay was 16,000 points Sun-Thu and 10,000 points Fri-Sat. I had a 10,000 points reward night reservation for the following Saturday, but changed to Econolodge Auckland Central due to its close proximity to the SkyBus Queen Street bus stop and my 8:45am flight. Choice Privileges high season reward rates kick in December 1 – April 15, 2017 at 20,000 points Sun-Thu and 16,000 points Fri-Sat.